Home of Beaujolais and other great French wines. This is a fascinating 1852 map of the French department of Rhone, France. This area produces the French AOC wine, Beaujolais. This wine is generally made of the Gamay grape which has a thin skin and is low in tannins. It is typically a light-bodied red wine. 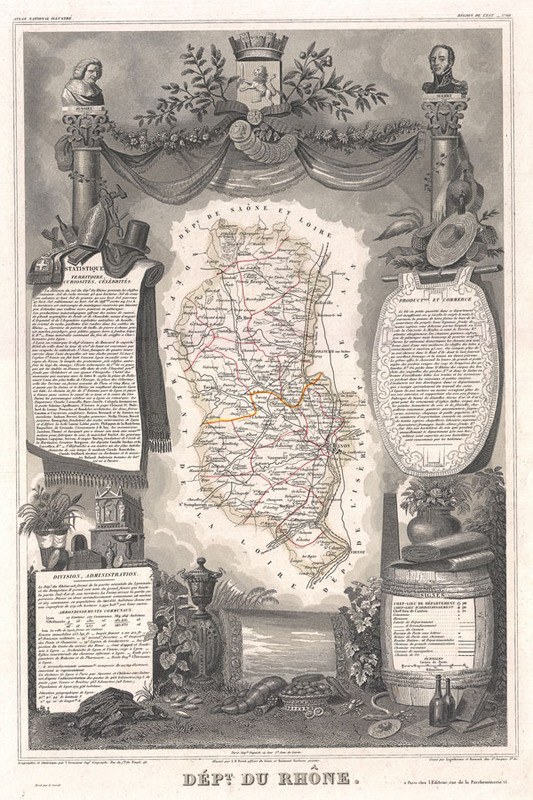 The map proper is surrounded by elaborate decorative engravings designed to illustrate both the natural beauty and trade richness of the land. There is a short textual history of the regions depicted on both the left and right sides of the map. Published by V. Levasseur in the 1852 edition of his Atlas National de la France Illustree.